- Yes we can. Change. Hope. The crowd of 480,000 Obama supporters cheered uncontrollably as Senator Hillary Clinton started her much-anticipated speech with these now infamous campaign slogans. She also affirmed her unwavering support for President-elect Obama, and pledged to serve her nation with dignity and honor as the next Secretary of State. "I promise you that we will take back this country, and to all of the naysayers out there, I harbor no ill feelings towards my former opponent - despite his lack of experience and substance." Obama organized the rally for Clinton to publicly acknowledge her acceptance of the position. Nearly six minutes into her speech, the crowd began to yawn and to stare at their watches - waiting for her speech to come to an end. Noticing their boredom, Sen. Clinton immediately screamed, "Yes we can! Change! Hope!" This sent the entire rally into a state of ecstatic hysteria. And as she concluded, she led the boisterous rally with four Nazi salutes - chanting "Sieg Hiel!" President-elect Obama acknowledged the crowd's enthusiasm, and saluted back to them. After the rally, Obama was interviewed by Brian Sussman, distinguished broadcaster and journalist. Sussman asked," Why did you pick Hillary as your Secretary of State, given that she and her husband never forgive and never forget?" Obama replied, "A very wise man once told me to keep your friends close to you, and you enemies even closer." - After reeling from an overwhelming defeat in the popular vote, consumer advocate and Presidential hopeful Ralph Nader has refused to concede the election to Sen. Obama. As he stood on the steps of the Tallahassee Court House, Nader reiterated his decision not to concede, and demanded a full manual recount. "This election was clearly stolen by Sen. Obama, and there is no other explanation that can be given to justify his victory." Nader also fielded questions from the press, which included reporters from the National Enquirer, Reader's Digest, and Aintmymedia - the only news outlets which gave coverage of his campaign. As Nader concluded his Press Conference, he also bashed the Obama candidacy, claiming that the Illinois Senator was nothing more than a spoiler who took away votes that would have otherwise gone to him. "Obama has shown a complete disdain for the integrity of the electoral process by running a shallow campaign, stealing votes in every precinct, and taking away support from me." Obama's campaign manager David Axelrod fired back. "This is a free country, and if Sen. Obama wants to run for President of the U.S. or for honorary chairman of the Weaverville Knitting Club, it is his constitutional right. The American people deserve more than only two choices." Pending a decision from the Florida State Supreme Court, the manual recount could cost upwards to $90M, depending on the number of precincts. 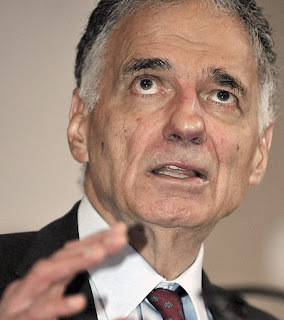 Nader gained ballot access in 46 states, mobilized disgruntled independents, and ran an aggressive campaign. 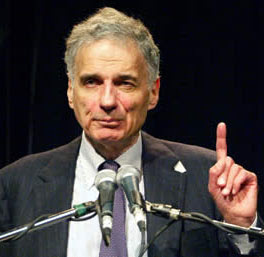 One thing is for certain - if Ralph Nader loses Florida, then Sen. Obama would indefinitely be labeled a spoiler for taking away the victory from him. - After repeated requests from the Media and the Obama Campaign, Sen. McCain has agreed to release his tax records. In an address to the NAACP, the Arizona senator reversed his previous decision to keep all of his tax records sealed from the public view. While speaking to the crowd in attendance, McCain explained why he changed his position. "My friends, I've always been under the impression that public officials like myself were exempt from having to release our tax records...I mean, if I cheated on my taxes one year, why would I want to make it public?" After McCain's speech, a reporter followed the senator and asked him why he released his tax records from 1928 , and nothing else more recent. Sen. McCain replied, "Listen you sorry excuse of a journalist, be happy with what you got. You don't have a right to question me. I'm a patriot." - Following the passage of the $857B Wall Street bailout bill, Congress addressed one final issue before departing for their 3-month recess: a National name change. In an address to 534 members of Congress, House Minority Leader John Boehner (R-OH) introduced H.R. 15798211. The legislation would mandate that Congress be allowed to change the name of U.S.A. to 'U.S.S.A: The United Socialist States of America.' Rep. Boehner said that Congress should no longer masquerade the true political identity of America. "After the nationalization of education, health care, the credit markets and financial services industry, we have finally progressed into a Socialist society," Boehner said. Following the approval of the 435-page bailout bill, congressional members began to discuss the current status America's political system, which led to Boehner's introduction of H.R. 15798211. Rep. Barney Frank (D-MA) co-sponsored the bill, and also voiced his support for the National name change. "We here in Congress are in a moment of Zen, with complete control and oversight of every action of the U.S. economy. We can search and spy without a warrant, monitor every financial transaction, control the credit market, and pass any bill we want to at any time." The bill is expected to pass with little opposition. 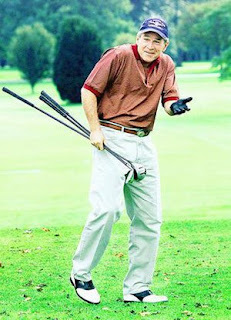 One such opponent is Congressman Ron Paul of Texas, who offered an alternative to the 'U.S.S.A.' name change. "We must not allow this nation to sink further into the abyss of government control, and this name change will only make matters worse for the American public." His alternative proposal: change the 50 stars on the U.S. 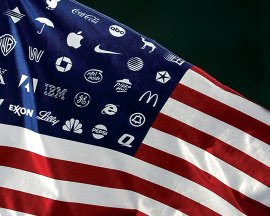 Flag to 50 Corporate logos. "If we are going to be honest, let us show the American people who really controls the government." President Bush is expected to sign the name-change legislation before he heads off to his Hooked on Phonics graduation ceremony. - U.S. Treasury Secretary Henry Paulson and FED Chairman Ben Bernanke recently escaped from the arduous Congressional hearings concerning the economic crisis. Over the previous two weeks, both Paulson and Bernanke pleaded for Congress to bailout Wall Street, which included Paulson's former employer Goldman Sachs. Temporarily borrowing Air Force One, they took off for Las Vegas. Racking up over $2.5B in debt, Paulson & Bernanke spent the weekend drinking, gambling, and touring the Hoover Dam. One witness reported that Bernanke came stumbling out of the Bellagio and threw over $5M in the courtyard fountain, for good luck. The witness asked Bernanke how he got all the money, and he replied, "Hey, I'm the only guy in America who can print as much cash as I want, ha!" He then proceeded to play 62 losing games of Blackjack at the Gold Nugget. Paulson reportedly ordered $500M worth of drinks at Caesar's Palace for himself, and all the Hotel guests. Unable to make up his mind about which entrees to order from the Restaurant, Paulson said "I'll order everything on the menu, the taxpayers could afford it." After having too much Heineken, he then disguised himself as a member of the Blue Man Group, and began using all of his tableware as musical instruments. Arriving back in Washington, Paulson and Bernanke pleaded with Congress to request that $2.5B be added to the $700 billion bailout plan for Wall Street. They claimed that if the bill didn't pass, they would not be safe from the current economic recession. Their Congressional testimony lasted only 20 minutes as a result of their hangovers. - With over 300 friends, family and dignitaries in attendance at his Crawford Ranch, President Bush celebrated his 1,000th day of vacation. Fireworks and patriotic music lit up the atmosphere as the festivities began - marking the highest number of vacation days ever taken by a U.S. President. "I am so proud that he is my president, who else in history has done so much with so little time on the job?" said Rush Limbaugh, the Master of Ceremonies. The event kicked off with the introduction of various speakers who had nothing but praise and admiration for Bush and his record as the 43rd President. "No other President, be he Republican or Democrat has courageously lead this nation into the largest national debt in the history of the world!" remarked Bill Kristol, editor of Weekly Standard. Sean Hannity of FOX News followed by saying, "This heroic leader is worthy of another 1,000 vacation days because of his resilience in protecting us from those Iraqi sheepherders and Afghan rug-makers." The audience stood and applauded as Pres. Bush shed two tears. Lastly, Bush concluded his much anticipated speech by saying, "I am excruciatingly underjoyed at the goodness you have bestowed me today. No sitting U.S. President, from King George the III to Bill Clinton, has ever been the recipient of such kindness and generology. Thank you very much America." When asked by a reporter if anything further was planned to commemorate this event, Bush replied, "I don't know, maybe we'll bomb Iran - or invade Finland. I've always wanted to do that." 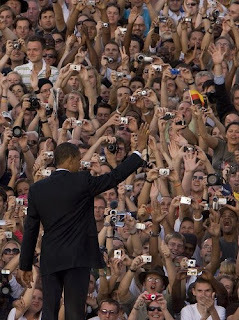 With shouts and cries of support from the crowd, Obama attempted in vain to quiet them down as he continued his speech. "I know you're all a little bit excited, but if anymore of you faint, I'm gonna run out of water bottles." The climax of his speech transpired as he unveiled his plan to prevent all deaths from occurring in America, if he is elected President. The plan would include the creation of additional federal departments and regulatory agencies. Sitting up front and waving signs that read 'Change' and 'Yes We Can,' representatives from the American Association of Retired People were arguably the loudest cheering supporters. Nearly twenty minutes into his speech, Sen. Obama began taking questions from the crowd in a town hall fashion. Adam Botscker of Casper,WY asked Obama, "What can you do to prevent on-the-job head injuries? I nearly died on my construction job." Obama responded by saying that he would create a "Department of Concussion Prevention" to prevent all future head injuries. Sally Potts of Albany, NY asked Obama what he would do to prevent suicide, given that her husband recently jumped off of the Brooklyn Bridge. Obama replied, "I am glad you asked that - in fact I have a plan to create another agency called the Department of Suicide, which will prevent all suicides from ever occurring again." Anthony Gregory of Berkley,CA also fielded a question to Obama. "Senator, what can you do to prevent the deaths of our troops in Afghanistan and Iraq, and how are you going to pay for this proposed plan?" After pausing for nearly one minute, Obama responded, "Well, I promise to prevent all deaths from occurring in America, but not for overseas. And as for the money, my friend Ben Bernanke assured me that we will have enough to pay for this." - In a recent address to People for the Ethical Treatment of Animals (PETA), Presidential candidate Ralph Nader spoke of his plans to reform animal health care. "We live in a broken system that seriously deprives American pets and non-domesticated animals of adequate health care coverage," he said. "We must devise a policy that grants single-payer Universal Health Care to all animals - regardless of ethnic background or social status." Nader also pulled no punches in his criticism of the two major parties. "This two-party dictatorship has steamrolled over the important issue of animal health care, and they ought to be ashamed. Both John McCain and Barack Obama are controlled by the same HMO and pharmaceutical lobbyists who have obstructed universal health care coverage for animals." When he was asked by a talking parrot which of the animals would be excluded from the health care plan, Nader replied, "Elephants and donkeys." - During his annual speech to the Defense Contractors Association, Senator McCain outlined his plans to pursue a more aggressive foreign policy than the current administration. In attendance were representatives from BAE, Lockheed Martin, Halliburton and nearly fifty-five other Defense Contractors. "My friends, we have to realize that there are many people around the world who do not like us. This is simply unacceptable. They are either with or against us." Sen. McCain emphasized, that during his recent world tour with Senators Graham & Lieberman, no one applauded or cheered for them upon their arrivals. "Frankly we were insulted. We took the time out of our three day work-week to visit London, Beirut, Paris, and Rome, and not so much as a 'Thank You' from those ungrateful foreigners." This elicited a score of 'boos' from the audience, as Sen. McCain concurred and nodded his head in disbelief. He then began to shake and turn red, with his wife Cindy calming him down and waving a fan in his face. After regaining his composure, Sen. McCain continued to expound upon his new foreign policy. "We are at a time when the world is solidly against us, and at this point it's either us or them. I'm sorry my friends, but this is a zero-sum game." Nearing the end of his speech, McCain added, "If elected President, I will initiate a pre-emptive war against the entire world, utilizing every military resource available." The whole crowd quickly erupted in cheers and applause for Sen. McCain. - During a recent press conference in front of Hoover Tower, Stanford University President John L. Hennessy explained why he refused to accept an $85M donation. "After reviewing all the necessary details and conducting a thorough cost-benefit analysis, I have decided it is in the best interest of this dignified institution to reject the proposed donation." The angry entrepreneur who offered the donation is Randolph McDougahinkey, a Bay Area Real Estate magnate. President Hennessy further commented, "As he sat across from me and proceeded to sign his $85M check, I asked him what he needed in return for his generous contribution. He requested that I change the name of our Cafeteria to, 'The Randolph McDougahinkey Culinary Emporium." "I then requested that he leave my office, and never return again to this noble institution." - Today Russian Prime Minister Vladimir Putin admitted as to why he escalated the recent bloody conflict with Georgia, in an exclusive interview with the Unassociated Press. "I never knew that it would come to this...so many military vehicles destroyed, buildings demolished and dead civilians." When asked to go into further detail of why this conflict initially began, Putin further explained. "I waited, and waited for my Vodka. Not even my boss President Dimitry Medvedev could cheer me up. So, I had to make that Georgian swindler pay, when I had the opportunity. Luckily, his invasion of South Ossetia gave me the chance to apply the necessary retribution as needed. So, if Saakashvili wants to end this bloody conflict, he had better send me my Vodka."